Categories: Bluegrass & Folk, Violins. 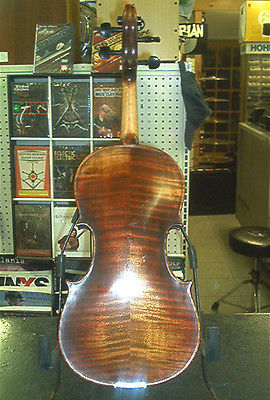 Excellent Quality 4/4 CPM Import Violin. 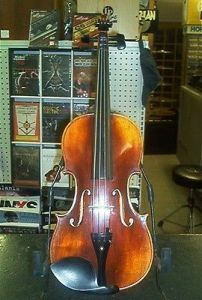 Solid Carved Spruce Top, Highly Flamed Solid Two Piece Maple Back , Flamed Maple Sides, Ebony Fingerboard, Maple Neck, Ebony Tuning Pegs & Tailpiece With Pearl Eye, Fine Tuner, Brazilwood Bow, Hard Case, Varnish Finish. Repaired Top Crack. Set Up and Shop Adjusted. Great Playability and Tone.